This artist's illustration shows the Luna Belt solar power ring station on the moon as envisioned by Japan's Shimizu Corporation. A giant ring of solar arrays around the moon would collect solar power, which would then be beamed to Earth via microwave and laser transmitters. When it comes to space and energy, we need to think big. That's what one Japanese company is doing — and they're reaching for the moon, literally. The best thing about the moon is that one lunar hemisphere is constantly bathed in sunlight (except for the occasional eclipse), so using solar arrays to generate power may not seem like such a stretch. Take China's recently-launched Chang'e 3 Yutu rover for example, it's solar powered. Also, Apollo astronauts set up solar-powered experiments on the lunar regolith. But how about wrapping the moon's equator in a 250 mile wide band of solar panels and beaming the power generated back to Earth? ANALYSIS: Space Energy: Is Space Solar Power Feasible? As Obi-Wan might say: "That's no moon. It's a space (solar power) station." "A shift from economical use of limited resources to the unlimited use of clean energy is the ultimate dream of all mankind," says the company's website. "The LUNA RING, our lunar solar power generation concept, translates this dream into reality through ingenious ideas coupled with advanced space technologies." Indeed, advanced space technologies will be needed, not only to harvest solar energy and efficiently beam it back to Earth, but its very construction will require several leaps in robotic technology development. Also, this mother of all engineering tasks will need to see some significant changes in international space treaties before it sees light of day. 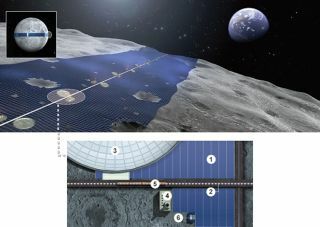 This graphic from Japan's Shimizu Corporation shows how the company's innovative Luna Belt concept could beam power from vast lunar solar arrays to Earth for consumption on the ground. It’s all very well building a huge array of solar panels around the moon, but how would the power be sent to Earth? As our atmosphere is virtually transparent to microwaves and lasers, Shimizu envisages solar energy being fed through microwave/laser transmitters located around the Earth-facing side of the moon. As the moon orbits the Earth and the Earth rotates, international receiving stations will feed electricity grids with plentiful lunar solar power as the moon rises to when it sets. The designers are keen to point out that this is a green energy resource that could benefit the whole of mankind. What's more, when the infrastructure is set up, other resources can be exploited — such as mining for precious minerals and fabricating products from regolith. One could imagine an international consortium of nations and/or companies that buy a stake in the LUNA RING to aid its construction. Each partner would then have rights to construct receiving stations in their geographical location of choice, weaning us off polluting sources of power. Japan, which was hurt by the devastating Fukushima meltdown in 2011, is actively seeking out alternative power resources to wean itself off nuclear energy — it doesn't get more "alternative" than this. Shimizu isn't suggesting we can build the LUNA RING now — they propose 2035 as the target start date. By that time, they assume that the technology behind space solar power — orbiting solar arrays that beam power to Earth via microwave transmitters — will have matured and we should have a sufficient in-space infrastructure to support such a project. Worrying about small practical details — such as how the LUNA RING solar panels will be cleaned and whether or not the international community would support such a plan — seems a little premature. The project may seem a little "out there," but assuming sufficiently developed current technologies, it could be done. Sure, it would be the biggest engineering task humans have ever undertaken, but it's not out of line with what we'd envisage an advanced civilization to construct. We would be well on our way to becoming a Type I civilization on the Kardashev scale if we could accomplish such a grand feat. The Kardashev scale is a well-known measure of a civilization's technological development. We are currently a Type 0; we have a very limited ability of harnessing global energy supplies. Should we reach a Type I, we will be adept at utilizing all of the energy available on Earth. So, if we were to set up a space solar power hub on the very useful natural satellite in orbit around our planet, we are bound to get a Kardashev-sized boost in the civilization stakes. It may only be a concept, but it's not hard to see how the LUNA RING could undergo some iterative steps to eventually become a reality. And sometimes, you have to think really big to confront some of the biggest challenges facing our species.